(Reuters) – A gunman opened fire on a crowd of mostly college students and young adults dancing at a crowded country and western bar in a suburb of Los Angeles late on Wednesday night, killing 12 people including a sheriff’s deputy, police said. Ventura County Sheriff Geoff Dean named the suspect as Ian Long, aged 28. He told a news conference Long had likely shot himself and that he was a veteran who had served in the U.S. Marine Corps. He said he appeared to have shot at random inside the club, using only a Glock .45-caliber handgun. There was no known motive, he said. 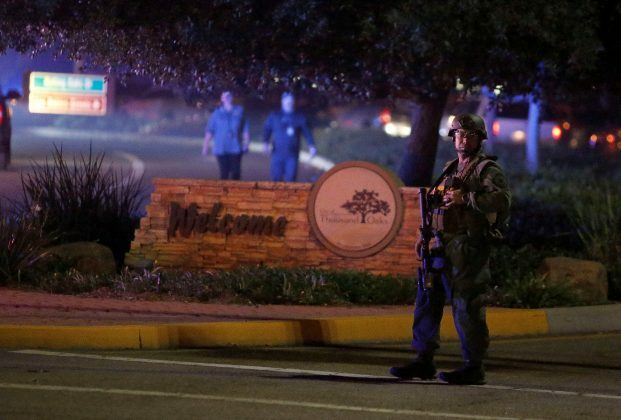 An unknown number of people were wounded in the shooting at the Borderline Bar and Grill, a popular venue with college students and young adults in the suburb of Thousand Oaks. Wednesday was dubbed “College Country Night”. It was the third mass shooting in the United States in under two weeks, six days after the death of two women at a yoga class in Tallahassee, Florida and 12 days after a gunman killed 11 worshippers at a synagogue in Pittsburgh, shouting “All Jews must die”. This entry was tagged 12 killed, California bar, Ian Long, Los Angeles, Marine Corps, Sheriff's deputy, Shooting, Veteran. Bookmark the permalink.